This article is part of a series of posts on how The New York Times covered the rise of fascism and world politics in the years leading up to World War II. In December 1937, with China and Japan at war and Europe on the brink, correspondent Herbert Russell wrote a tongue-in-cheek article in The New York Times Magazine about the international appeal of Mickey Mouse, whose image and personality varied across countries. Now that that unreconstructed international rebel, Mickey Mouse, has been thrown out of Yugoslavia for conspiring against the throne—he together with the newspaper correspondent who rashly reported the plot—the expulsions from foreign countries of this arch-enemy of nations have risen to two. Hitler once barred him from Germany because Mickey was accompanied by a brigade of animals wearing Uhlan helmets, which was a reflection on the honor of the German Army and too serious to be passed over. Of course, Mickey was eventually pardoned, because not even dictators are completely immune to his spell; Mussolini loves him. The incident in Yugoslavia serves to emphasize the international character of Mickey's activities, the boring from within by means of which he is winning the populations of a good part of the world to his cause. He is apparently without principles and can be all things to all men. While Yugoslavia suspects him of communistic and revolutionary designs, the Soviet thinks he represents the meekness and mildness of the masses under capitalism, and has countered by creating a Russian Mickey, known as Yozh, or the Porcupine, an animal favorite of Russian children. But Yozh will probably turn out to be the old Mickey in disguise. Mickey does not care what he does so long as he gains his ends—he is completely unscrupulous—and while his victims laugh as he conspires. Or so one might think. Walt Disney, his father and Prime Minister, slyly deprecates the subtleties of Mickey's character. He says that all he wants is laughter, that he has no ulterior thoughts, no philosophy of life, no hidden political, social, or psychological motivations, none of the Eastern mysticism of which he is sometimes suspected, with reason, as will be seen. Those who read anything else into his life are all wrong, says Mr. Disney—but look at the record, as Al Smith used to remark. In the first place there is no doubt that Mickey is an internationalist, and to be an internationalist these days is unorthodox to every one except Leon Trotsky. Mickey has been in thirty-eight countries in the world, and he is looking for others. In all these countries he has been popular and has captivated the masses; and that, to say the least, is suspicious. He promises them release for the time from worry and unhappiness, and speaks of a promised land where anything can, and does, happen. That the great and near-great laugh at him merely proves his universality. He draws no distinctions, race, color or previous condition; he is kind even to jailbirds. President Roosevelt is his friend, and Queen Mother Mary sends for him regularly. He is the idol of savages, as Douglas Fairbanks found in Africa, and the Zulus refuse cakes of soap unless they bear his picture, just as natives used to refuse coins which did not have Queen Victoria's picture on them. Reports from abroad continually show his increasing influence, an influence as mysterious as it is real. England, in self-defense, is creating a rival to him. In France his black-shirted pictures are everywhere. The shortness of his trousers has caused him to be looked upon as almost a Sans Culotte, or revolutionary, and his creatures, similarly dressed, may be found serving as ushers in theatres. A traveler in the East found Mickey peeking from a store window in Manchuli, which is a transfer point from the Chinese Eastern Railway to the Transsiberian. His being there at that time, just before the outbreak in China, was looked upon as highly suspicious, although it could not be determined whether he was coming from or going to Moscow. And paradoxically, he is the most popular figure in Japan, next to the Emperor. Mickey is not only appealing to the grown-up mob in the countries of the world; he has taken a leaf from the dictators and is organizing youth movements. These exist almost everywhere, from east to west, and from Singapore to Juneau, Alaska. Nearly every nationality is represented in the Singapore Mickey Mouse Club, but this cell of agitation has apparently not yet aroused the British Government to take action against it as protection for the Singapore naval base. 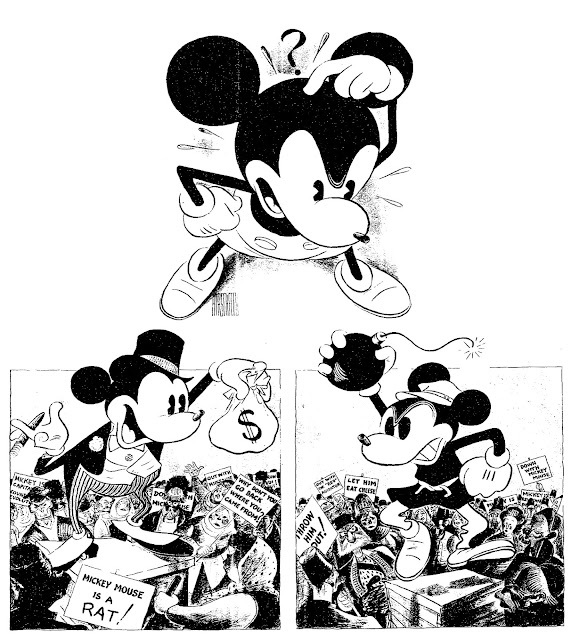 Low, the British cartoonist, has pointed out that Mickey must appeal to the sophisticated before he can be completely successful. Mr. Low thinks Mickey lacks subtlety, and that his antics merely titillate the lower nervous system; but Low may have underestimated Mickey. The Singapore club happens to be composed of adults, but it is one of the few exceptions. Most of the organizations take in only children, who carry a Mickey Mouse emblem and take a Mickey Mouse oath, which on its face is an innocuous pledge of good-will and patriotism. But they have a Mickey song, and a grip and a password. There are 1,500 of these clubs in the United States alone. Whether Mickey is secretly building up cells in all these countries is not known, although the OGPU and the secret police of Germany might investigate. None of these nations, so far, has been able to agree upon interpretation of either Mickey or his activities. They see in him merely a reflection of their own ideologies or those of their enemies, according to their national psychology. His apparent simplicity, the fact that he is on the surface a gay creature who dashes madly into impossible situations, and escapes, giving the tail-waving, nose-thumbing Mickey salute—these things completely evade somber analysis. There are continual attempts by the intelligentsia to interpret him, but he escapes them as easily as he avoided Mr. Low. Searching inquiry into Mickey has been made by a writer in The London Spectator, with the resulting judgment that he is an ebullient little rat, without an ounce of brains, half mug and half gallant, who by turns is meek and brave, and who represents the fantasy world in which adults, as well as children, may wander in a kind of Nirvana. That there are no limits to his kingdom is also one of the allurements of Mickey which appeal to all the world. The air armadas of Europe, the plunging submarines, the skittering destroyers and dignified battleships cannot compete with the creatures which Mickey can call forth to battle if he chooses. He can scuttle a pirate with the aid of a sawfish and turn tortoises into tanks. The capacity of such a Mouse for trouble is enormous, and those who pry into his motives cannot believe that he does everything for fun. He has appeared in international cartoons as a figure of importance. Newspapers in France and Italy and Russia speculate on his future and ineffectually try to link him with Br'er Rabbit and Krazy Kat as one who will have his day and then be forgotten. But Mickey shrugs his shoulders and bides his time, while his comic strips are in twenty-seven languages, and he speaks fluently four languages to hundreds of millions of people. Now for his Eastern mysticism. The simplicity of Mickey is denied by one simple fact which has been overlooked by all the sage commentators and interpreters. Mickey can and does appear in thirty-eight countries at once. He is the most omniscient mouse in the world. Whether he is an Eastern Yogi, or Mahatma, or a Lama from Tibet, in the abbreviated raiment of a mouse, some odd victim of transmigration, has never been revealed since he was discovered seven years ago. But his Eastern origin may be assumed from the fact that he has such an affinity for Asiatic peoples—the Chinese seem to recognize in him much of their own guileful humor. Perhaps only as Mouse could he have won such world-wide fame, and if so, it rather confutes Mr. Low's theory of his lack of subtlety. There is one other significant point to be made in any review of Mickey's international career. It is nothing that he is in Who's Who, the Encyclopaedia Britannica, and has been decorated many times. But it is something that he has found a niche among the world's great in Mme. Tussaud's Wax Works in London. Somebody has recognized him for what he is to be; somebody knows his future. Can it be possible that Mickey is waiting patiently for the collapse of civilization, waiting until the nations have pulled down their house of cards and destroyed all their own pretensions? Does he believe that the broken and oppressed people, wallowing in despond, will then turn to the one person whom they can depend upon for that happiness, and demand that Mickey shall become Emperor of the World? Perhaps Mickey isn't so dumb as he looks. Maybe that is why he is winning the ordinary folk and the great, building his youth movement through clubs, boring from within in Europe, Asia, Africa, India and the Americas. And what a Cabinet he would have! Prime Minister, Walt Disney; Empress and Minister of Education, the ubiquitous Minnie; Minister of International Police, Pluto the Pup; Minister of Propaganda and Enlightenment, that notoriously bad egg, Donald Duck; and last, but not least, Minister of Nutrition, Clarabelle the Cow. The only trouble with the idea of this world conspiracy of Mickey's is that its headquarters are in Hollywood.